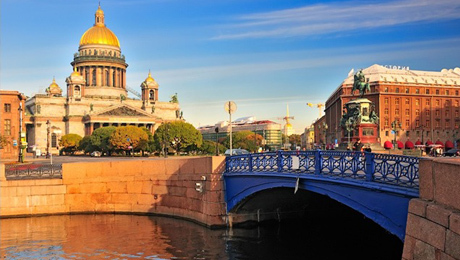 It's hard to move more than a few hundred meters in the centre of St. Petersburg without crossing a bridge. The network of rivers and canals that comprises the Neva Delta has made bridges and bridge-building a vital part of St. Petersburg's infrastructure since the founding of the city, and many of Russia's greatest architects and engineers have taken up the challenge over the last three centuries. Of the 342 bridges in the city, several of them are technical and aesthetic masterpieces. 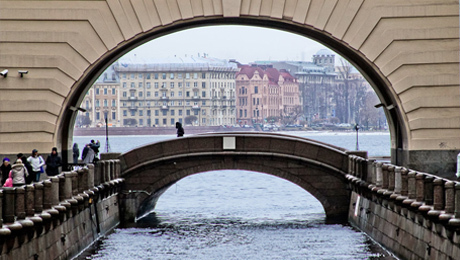 Our selection of unmissable bridges provides detailed information and beautiful photographs of ten of St. Petersburg's most beautiful bridges. Situated in front of the Mariinsky Palace just beside Isaac's Square on the Moika River, the Blue Bridge is considered the widest bridge in the city: 97.3 meters wide and 32.5 meters long. One of the most intriguing and nicest bridges in the city, this painted bridge designed by the architect William Heste in 1818, is easily unnoticed. Designed by the French architect Auguste de Montferrand in 1834, Pevchesky Bridge is the third-widest bridge in the city, after the Blue Bridge and Kazansky Bridge. 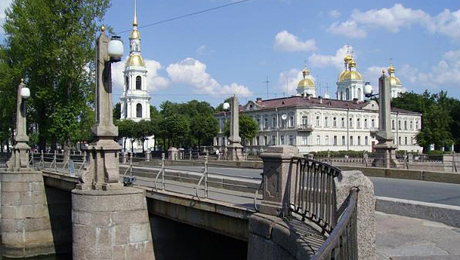 Known as the Yellow Bridge for the colour of the cast iron railings, a few years later it became Pevchesky Bridge because of the Palace Chapel Choir located nearby. History says that Nicholas I was the first person who walked across the bridge. Crossing the Moika River near New Holland, Potseluev Bridge is a cast-iron single-span structure on granite-faced packed-rubble piers. The bridge was erected in 1816 on the site of a wooden pedestrian bridge from 1738. The name, which sounds in Russian like "Bridge of Kisses", actually comes from the surname of the proprietor of a tavern that stood nearby in the 18th century. 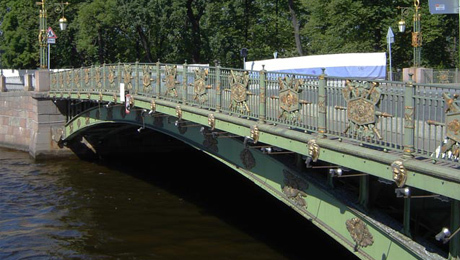 This typically elegant bridge, with its decorative cast-iron railings and street lamps mounted on four granite obelisks, was fully restored in the 1960s. The Fontanka bridges have all their unique style but they all no longer raise. 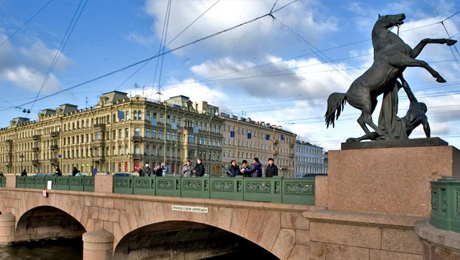 Anichkov Bridge is the most remarkable one in Fontanka because of the sculptures by Pyotr Klodt that crown its corner. The bridge is already located in one of the most charming place of Saint Petersburg, Nevsky Prospekt and the Horse Tamers make it even more fascinating. It dates back to 1716, but the bridge was completely reconstructed between 1906-1908 due to the instability of the structure in the arches. During the Siege of Leningrad the sculptures survive the war because they were removed, buried in the ground and eventually restored on 1 May 1945. Just a short walk from Nevsky Prospekt, this beautiful stone bridge across the Fontanka River dates back to the 1780s and is one of the few bridges from that era to have survived unaltered. With its distinctive pavilions and elegant symmetry, it is well worth a visit. Named after the great Russian polymath Mikhail Lomonosov, whose advances in chemistry, mathematics, linguistics and literature made him a kind of one-man Russian Enlightenment during the reigns of Empresses Elizabeth and Catherine the Great, this beautiful stone bridge crosses the Fontanka River about 300m south of Nevsky Prospekt. Dating from the late 18th century, and with its original design still intact, Lomonosov Bridge is well worth a short detour. 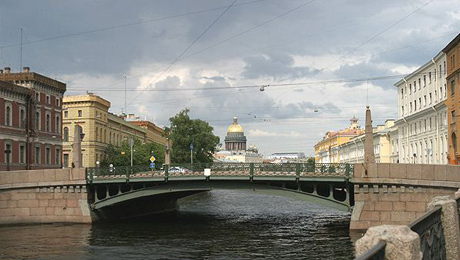 Standing in one of St. Petersburg's most picturesque spots, across the Fontanka River between the Engineer's Castle and the Summer Gardens, the Panteleimonovsky Bridge is named after the nearby Church of St. Panteleimon. A wooden aqueduct carrying water to the Summer Garden fountains was built here in the 1720s, and was replaced in 1824 with an elegant chain bridge, removed for safety reasons and replaced with the current single-span arched steel bridge, completed in 1914 and remarkable for its ornate, gilt-laden lamps, railings and cladding. 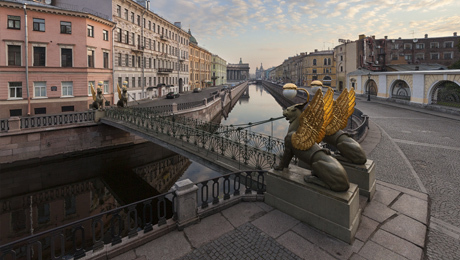 Just a few minutes' walk down the Griboedov Canal from Nevsky Prospekt and Kazan Cathedral, St. Petersburg's Bank Bridge is one of the world's most beautiful pedestrian bridges, thanks to the glorious sculptures of golden-winged griffons by famous local sculptor Pavel Sokolov. At 1.85 meters, it is also the narrowest in the city, a miniature architectural gem. 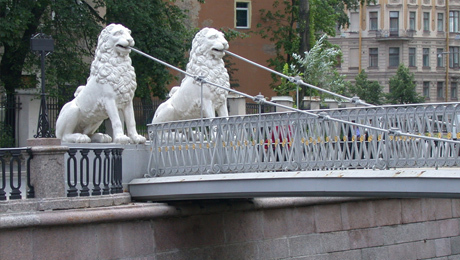 Crossing the Griboedov Canal, not far from the Mariinsky Theatre, you can find the small pedestrian Lions Bridge, one of St Petersburg's most celebrated landmarks and a popular spot for taking photos.Designed by German engineer Wilhelm Von Treitteur and opened in 1826, the bridge took its name from the crowned, cast iron sculptures of four white lions. 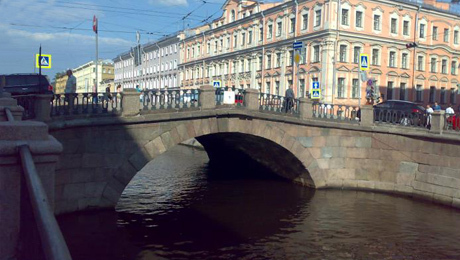 One of St. Petersburg's oldest stone bridges - its name means simply 'Stone Bridge' - Kamenny Bridge was laid across the Griboedov Canal between 1774 and 1778. A single-span granite bridge, it measures 19.7 meters, and blends seamlessly into the embankments of the canal, which were constructed at the same time. Even the iron railings are identical to those running along the embankments. 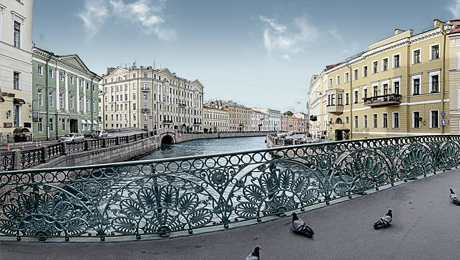 Kamenny Bridge carries Gorokhovaya Ulitsa, one of the city center's oldest streets, across the canal. Crossing the Griboedov Canal at its confluence with the Kryukov Canal, the Pikalov Bridge forms an ensemble with the Staro-Nikolsky and Krasnogvardeysky Bridges, and provides beautiful views onto the Cathedral of St. Nicholas, and onto seven other bridges. The three-span bridge dates back to 1785, when the granite-faced abutments supported wooden spans. The wooden spans were replaced with metal in 1906 and four granite obelisks topped with gold spheres. Later, oval lamps were added to the obelisks. The bridge was restored in 1993. 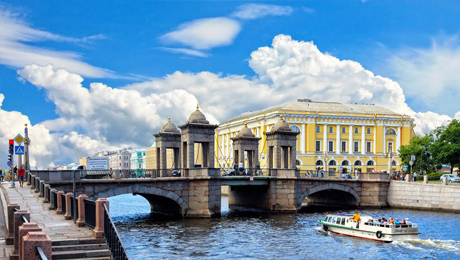 The Hermitage Bridge crosses the little Winter Canal, which moves into the Neva River right next to the New Hermitage, is the oldest and smallest stone bridge in the city as well as one of the most pictured in postcards. Built in 1720 from brick and limestone with a granite exterior by Herman van Boles, today this historical bridge is part of the Hermitage and Winter Palace district. Bridges in Saint Petersburg are astonishing and unique monuments; especially the drawbridges offer you a breathtaking and extraordinary spectacle during the White Nights. Even if they are a great attraction for tourists the drawbridge raising can be really annoying if you get stuck on the wrong side of the river. From the end of April to November, during the navigation period, you’d better check the bridge timetable if you plan to stay late in the city center.